From costly bad bets subsidizing the development of Kansas City’s Power & Light District to promoting the St. Louis Ballpark Village at the expense of businesses already in the area, city leaders are eager to combat urban flight to the suburbs. But urban decline isn’t unique to Missouri. People all over the United States are voting for suburbs and exurbs with their feet. Giving tax dollars to a few more bars and restaurants won’t change that. The spurt of urban core growth that occurred immediately after the housing bust was short lived. 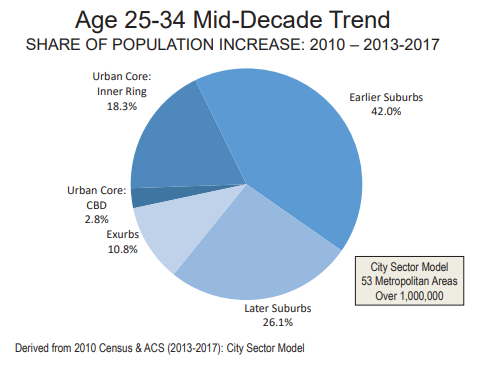 The preponderance of metropolitan growth has returned to the suburbs and exurbs, as had been the case at least since the late 1940s. Kotkin and Cox make their case with census data: Suburbs are growing much faster than urban areas. Claims by urbanists such as Richard Florida that “creative class” millennials would come to cities and stay were wrong, as Florida himself admits. Unfortunately, cities like Kansas City and St. Louis spent billions of dollars exacerbating the problems of gentrification through subsidies, and continue to do so, chasing a myth. If city leaders only understood that they are swimming against a nationwide current, they might be a bit more circumspect in their distribution of taxpayer dollars. But whether it’s misplaced faith in the promises of urban developers or the allure of campaign contributions from those same companies, something is compelling policymakers to invest taxpayer dollars in projects that benefit the developers at the expense of the communities where they are undertaken. Meanwhile, organizations such as the Downtown Council in Kansas City vacuum up tax dollars and spit out absurd population growth claims. It seems clear that gentrification has not benefited the poor and may well have harmed them by spiking housing prices and, perhaps less obviously, restructuring urban economies in ways that hurt blue collar workers. Reporters and politicians might swoon over the latest “hip” urban manifestation, but the poverty rate is still two-thirds higher in urban cores than in the suburbs. Beyond Gentrification then focuses on three cities—Chicago, Dallas, and Los Angeles—to flesh out what is happening in cities across the country. These things are happening in Kansas City and St. Louis, too. And no convention hotel, trolley, or new stadium will turn this around. We know, because other cities are pinning their hopes to developments like these, and it isn’t working. It won’t work for us, either. City leaders across Missouri need to understand their cities’ competitive advantages and promote them. (The Show-Me Institute has already catalogued some for both Kansas City and St. Louis.) They need to deliver on infrastructure, public safety, and basic services efficiently and effectively. And they need to resist diverting tax dollars in pursuit of urban development that often does more harm than good to the surrounding communities.